Welding as like other occupations is associated with workplace hazards that can affect the health of those who engaged in it especially if exposure is on a regular or cumulative basis. Electric arc welding is mainly practiced on a small scale in Nigeria and this means that in many instances production occurs in workers own homes or residential areas where there can be serious health hazards including exposure of other occupants or family members to harmful dust, chemicals, noise, and heat. Inspection of such places is largely impossible in view of their large number and wide distribution. Encouraging practices of occupational safety through health education is the practicable and feasible means of reducing or preventing the exposure of welders to various hazards. Engineering control, work practices, and administrative controls are the primary means of reducing exposure to welding related occupational hazards. When effective work practices or engineering controls are not feasible or while such control are being instituted, appropriate personal protective equipment (PPE) must be used. Surveys done in India, South Africa and Nigeria reported poor usage of PPE among welders. In Nigeria, it was reported that only 35.9% of welders used PPE. Poor awareness of various safety gadgets used for protection might be a factor responsible for the poor use of PPE among welders Nigeria. The health education intervention study will create awareness on various safety equipment used for protection among the welders and stress the importance and the need for the adoption of appropriate practices of occupational safety by the welders. Limited study has been done on the practices of occupational safety among welders in Ilorin where the study is been done. Data generated from this study will help the policy makers to develop guidelines to regulate small scale welding operations. The study will go a long way in improving the lot of small-scale arc welders. The aim of this study is to assess the effect of health education intervention on awareness and practices of occupational safety among electric arc welders in Ilorin. The study was carried out in Ilorin the capital city of Kwara State Nigeria. It is located within the north central geopolitical zone of Nigeria with a distance of about 302 km North of Lagos and 475 km South of Abuja. It lies between the latitude 8° north and 4° south and has a population of 800,000 with the population growth rate of 3%. Ilorin is made up of 3 local government areas vis. ; Ilorin East, Ilorin West, and Ilorin South. The predominant ethnic group is Yoruba. The predominant religions are Islam and Christianity. There is only one major factory that produces iron-rod and metal-wire. Electric arc welding is mostly practiced as a small scale enterprise in the city of Ilorin with many welding shops spread all over the city. The study population was self-employed electric arc welders, their journeymen and apprentices in all the 932 registered workshops (932) in Ilorin East, Ilorin West, and Ilorin South local government areas. A letter of introduction was collected from the ethical committee of University of Ilorin Teaching Hospital to the State Chairman of the Electric Arc Welders union. The letter requested for permission on proposed study. The purpose and benefit of the research was highlighted and informed consent was sought from the participants. Two out of three local government areas that are located at far distances from each other were purposively picked in other to avoid information drift. One served as intervention while the other served as control. Ilorin East local government was eventually picked as the intervention while Ilorin West was picked as the control. It was a health education intervention study that was done in three stages: Preintervention, intervention, and postintervention stages. The preintervention stage was conducted using an interviewer administered semi-structured questionnaire as a research instrument for data collection. These were used to collect baseline information on awareness and practices of occupational safety measures. The questionnaire was administered to the respondents in both study (Ilorin East local government area) and control group (Ilorin West local government area) at their respective workshops. In the intervention stage, the welders in the intervention group were given health education while the control group had their health education after the evaluation. The health education was conducted by health educators, the researcher, and the research assistants. Various health educational methods and materials were utilized and these include health talk, posters, flip charts, and other audio-visual materials. Five sessions of health education were held on the zonal basis. The welders, their journeymen and apprentices in all the workshops selected for the intervention that fall within the same zone were given health education. The venue of all the health education sessions was the state secretariat of the welders union. Each of the health education sessions was held at different dates. Each session started by 10 am and lasted for about 4 h. Fifty-seven participants were invited for each health education session and all the participants invited for each health education session were in attendance. Postintervention stage was conducted using same interviewer administered semi-structured questionnaire and containing the same contents as in preintervention stage. The questionnaire was administered to the intervention and control respondents at their respective workshops. Selection of respondents in the intervention (Ilorin East local government area) and control local government area (Ilorin West) was carried out using multi-stage sampling techniques. In the first stage, five zones were selected from each of the two local government areas chosen for the study (Ilorin East and Ilorin West) by simple random sampling technique. Ilorin West is made up of eleven zones while Ilorin East is made up of six zones. In the second stage, from the list of the registered workshops in each of the zones selected for the intervention and control study, 20 registered workshops were selected by simple random sampling. In the third stage, from each workshop selected, all welders, their journeymen, and apprentices that had more than 6 months working experience were recruited for the study. Equal number of respondents was taken from each of the selected zones chosen for the intervention and control study (57 respondents from each zones). However, where the eligible respondents were more than 57/20 workshops sampled in any of the zones selected for the study. Simple random sampling was used to select the required 57 respondents. The questionnaire was pretested in Offa, Kwara state which is about 45 km from Ilorin. The completed questionnaire was collected and collated by the researcher and the research assistants. The questionnaire was sorted and coded and all completed ones were checked for errors and completeness. Data were entered using Epi-info version 3.5.1 software (Centre for Disease Control and Prevention, Atlanta GA 30333) package before the analysis of the data. The preintervention data were analyzed separately and comparison made for both study and control groups. 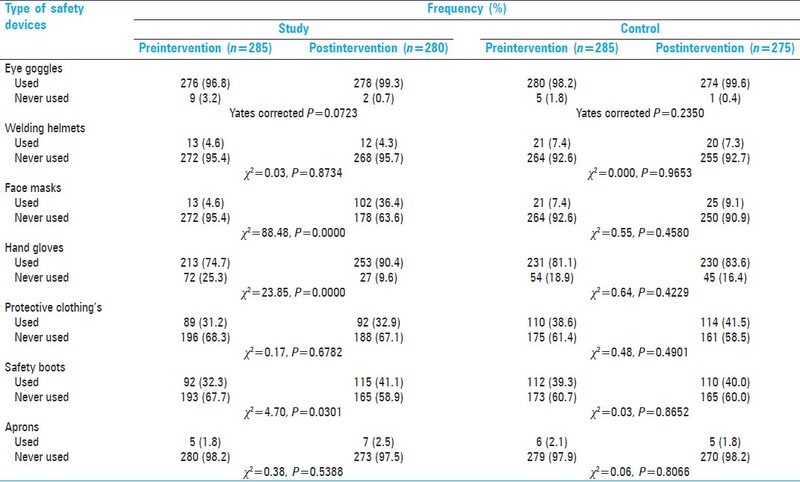 The postintervention data for study and control were also compared with the preintervention data. Comparison was done by cross tabulation of variables, frequency distribution tables, and percentiles were also generated. Chi-square analysis was used to determine the statistical significance of observed differences between the study and control groups before the intervention and after intervention. Level of significance was set at P < 0.05. Welders, journeymen, and apprentices willing to participate in the study were included in the study. Apprentices with work experience of <6 months were excluded from the study. Difficulty in monitoring use throughout the working hours because of the incessant power supply as welding occupation depend largely on electricity supply. At the preintervention phase, a total of 285 respondents were interviewed in the intervention or study group likewise in the control group using interviewer administered questionnaire. Four months after intervention phase, 280 study respondents and 275 control respondents were available for the postintervention phase of the study. The attrition rate in the study group been 1.76% and that of the control group was 3.51%. [Table 1] represents awareness of PPE before and after the intervention in the study and control groups. Before the intervention, 279 (97.9%) of the study respondents were aware of the of eye goggles as a means of protection while 280 (100%) became aware of eye goggles at postintervention phase. This difference in proportion is statistically significant (0.0160). Similarly, in the control group, the proportion of the respondents who were aware of eye goggles decrease from 282 (98.9%) to 275 (100%). This difference in proportion is not statistically significant (P = 0.1311). There was a statistically significant difference in the awareness of protective effects of handgloves in the study group (P = 0.0008). The number of respondents in the study group that were aware of hand gloves increased from 206 (72.3%) preintervention to 235 (83.9%) postintervention while in control, the difference between the awareness of hand glove before and after the intervention was not statistically significant (P = 0.3167). Less than one-third of the respondents in the study group were aware of welding helmet 20 (7%), face mask 4 (1.4%), apron 4 (1.4%) and protective clothing 79 (27.7%) preintervention and all showed significant increases in awareness postintervention (P = 0.000). Less than half of the respondents in the control group were aware of welding helmets 28 (9.8%), face masks 7 (2.4%), aprons 3 (1.1%), and protective clothing's 100 (35.1%) preintervention with none of them showing a significant increase in awareness postintervention. [Table 2] represents awareness of maximum working hour per day that is considered safe. Before the intervention, 42 (14.7%) study respondents were aware of maximum working hour per day that is considered safe while 103 (36.8%) became aware at postintervention phase. This difference in proportion was statistically significant (P = 0.0000). In the control group, 27 (9.5%) were aware of maximum working hour that is considered safe preintervention, which increased to 30 (10.9%) postintervention. This difference in proportion was not statistically significant (P = 0.5743). 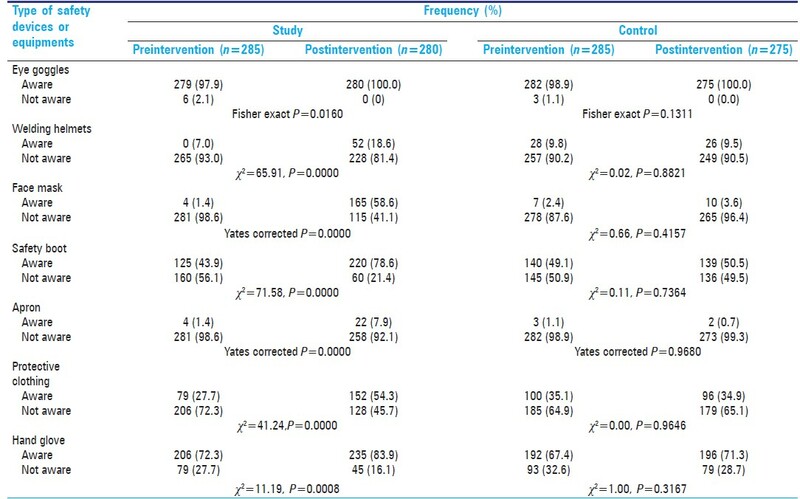 [Table 3] represents the use of PPEs before and after the intervention for both study and control groups. Eye-goggle was the most used preintervention for both the study (96.8%) and control group (100%). Increased in the use of eye goggles 278 (99.3%) postintervention was not statistically significant (study P = 0.0723) and (control P = 0.2350). Welding apron was the least used preintervention for both the study group (1.8%) and control group (2.5%). However, the difference in the use of welding aprons postintervention in the study (P = 0.5388) and control group (P = 0.8066) was not statistically significant. There were significant increases in the use of face-mask (P = 0.0000), hand-gloves (P = 0.0000) and safety boot (P = 0.0000) postintervention among the study group. There was no significant increase in the use of any of the protective equipment postintervention in the control group. Awareness of eye-goggles and hand gloves as safety devices among the respondents in both the study and control groups were high. This finding of high awareness of eye goggles as a safety gadget is similar to another study done in Owo Western Nigeria by Omolase where all the respondents interviewed were aware of the protective effects of the eye goggles. This might be because the most common health complaints experienced by the welders as shown in another study were arc-eye injuries and cut/injuries to the hand. High awareness of protective effects of a safety gadget will possibly lead to increase utilization of the gadget. The awareness of face-masks, welding helmets, and aprons as safety gadgets for protection was poor. Respondents poor knowledge of the hazards associated with the nonuse of these safety gadgets might be responsible for their poor awareness. Another possible explanation for this might be because the health hazards associated with none use of face-masks, welding helmets and aprons are not as common as those associated with the nonuse of eye-goggles and hand gloves among the welders. Similar study done in India reported poor awareness of the use of face masks. However, health education intervention has significantly increased the awareness of all the safety gadgets used for protection in the study group. Before the intervention, the level of awareness of the respondents in the study (14.7%) and control group (9.7%) of the maximum working hours per day that is considered safe was low. Most of the respondents had no formal training for the vocation. Most of them were trained through apprenticeship scheme and hence lack the opportunity of benefitting from health education and hence might not have had the opportunities to know the maximum working hours per day that is, considered safe. Health education intervention for the study group has significantly increased their awareness (P = 0.0000). The maximum permissible occupational exposure limit recommended for welders by Alberta health and safety legislation is maximum of 8 h/day and 5 days/week. The law in Alberta requires that employers keep exposure level to harmful substances as low as reasonably practical. If over the years of working as a welder quantities of gases, fumes, and vapor breathe in is greater than the occupational exposure limit it is likely to have adverse effect. Most of the respondents in the study group (96.8%) and the control group (98.2%) used eye goggles. High awareness of eye goggles as a form of protection against hazards by the respondents explained the reported high use eye goggles among the study and control groups. This finding is comparatively higher than what was obtained from a similar study done by Sabitu et al. in Northern Nigeria where 60.9% of the respondents interviewed reported the use of eye-goggles and by Issa  in Benin city Nigeria where 35.9% of welders interviewed reported the use of eye-goggles. Frequent use of eye-goggles will reduce the incidence of occular injuries among the welders. More than two-third of the respondents in the study (74.7%) and control group (81.1%) used hand gloves during welding. High awareness of hand-gloves as a form of protection against hazards also explained reported high use of hand gloves among the respondents in the study and control groups. This finding is comparatively higher than what was obtained from a similar study done by Sabitu et al. in Northern Nigeria where 50.3% of the respondents interviewed reported the use of hand gloves and by Issa  in Benin city, Nigeria where 20.8% of welders interviewed reported the use of hand gloves. Frequent use of hand gloves will reduce the incidence of cut/injuries to the hand from sharp metals among the welders. The use of welding apron, welding helmets, and face-mask was reportedly low in the study and control groups simply because of poor awareness of these equipments as forms of occupational safety among the respondents. This finding is similar to the result obtained from another study where poor use of welding helmets (19.7%), aprons (24.8%), and face-masks (23%) were also reported. The use of face mask reduced the inhalation of welding fumes that may result in the development of cancer, respiratory problem and even infertility in males. Use of welding helmet helps to reduce the incidence of head injury resulting from fall. There was statistically significant increase in the reported use of face masks (P = 0.0000), hand gloves (P = 0.0000), safety boots (P = 0.031) in the study group with health education intervention. There was low awareness and use of PPE by the respondents in both groups with the exception of the use of eye goggles and hand gloves. Health education intervention for the study group brought about increased awareness and use of PPE. There is need for proper education of welders on workplace hazards, the types and use of different protective devices in other to safeguard their health. 1. Vimesh-Jani T, Mazumumda V. Prevalence of respiratory morbidity among welders in unorganised sector of Baroda City. Indian J Occup Environ Med 2004;8:16-21. 2. International Labour Organization (ILO). International Classification of Occupations. Revised ed. Geneva: International Labour Office; 1968. 3. Nicholas C, Wendy D, Benjamin MF, Leslie HG, David G, Murray GM, et al., editors. "Welding". Encyclopedia Britanica. Ultimate Reference Suit. Chicago: Encyclopedia Britannica Inc.; 2010. 4. Isah EC, Okojie OH. Occupational health problems of welders in Benin City, Nigeria. J Med Biomed Res 2006;5:64-9. 5. Work Safe Alberta. A Welder's Guide to the Hazards of Welding Fumes and Gases. Government of Alberta, Empolyment and Immigration. Work Place Health and Safety Bulletin; 2008. p. 1-16. 6. Federal Republic of Nigeria. Legal Notice on the Publication of the Details of the Breakdown of the National and State Provisional Total 2006 Census; 2007. 7. Omolase CO, Mahmood AO. The welders' protective goggles. An evaluation of its appreciation. Niger J Surg Sci 2007; 17:54-8. 8. Sabitu K, Iliyasu Z, Dauda MM. Awareness of occupational hazards and utilization of safety measures among welders in Kaduna metropolis, northern Nigeria. Ann Afr Med 2009;8:46-51.